Agriculture accounts for 28% of the gross domestic product, and it employs 67% of the total workforce (FAO, 2014; World Bank, 2015). Given the increase in migrations predominantly labour-related reasons, agriculture sector of Cambodia has been feminized that 75% of the Agriculture labour force is made up of women. Women farmers role are frequently unrecognized as economic actors, both at household level and in the agriculture value chains. In 2015, Oxfam worked with the Ministry of Agriculture, Forestry and Fisheries in collaboration with other I/NGOs to organize women farmer forums at sub-national level in five regions: Mekong, Southern Tonle Sab, Northern Tonle Sab, Costal, and Low Land areas. Those representatives identified key challenges, which required integrated support and interventions from all relevant stakeholders especially the Royal Government of Cambodia. Identified challenges were lack of 1) access to agriculture extensions, 2) access to innovation and markets, and 3) access to capital for better agriculture value chains. The project aims to improve women’s economic position in agriculture value chains so that women enjoy a bigger share of the value they produce. The project will seek the participation of men and their involvement to challenge gender imbalances. It will support women’s collective access to key inputs, information and skills and their capacity to influence positively Private Sector and Government policies and practices. 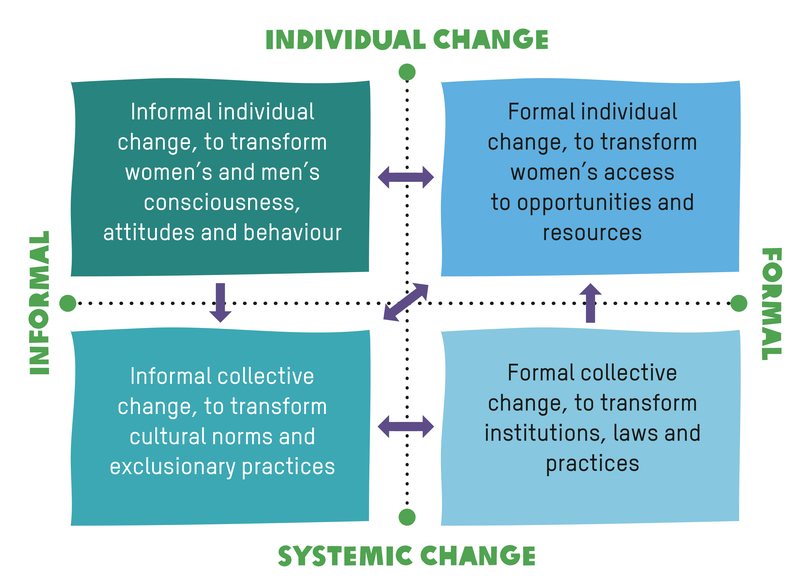 Holistic: Sustainable changes in Women Economic Empowerment (WEE) requires parallel progress in women’s social, political and personal empowerment. Systemic: We address changes required at asystemic level to achieve WEE at scale.